There many types of toy train available for hobbyist, enthusiast and/or kids to choose from. You can either choose between modern trains, electric trains, wooden trains, Thomas trains, Brio Trains, Chuggington Trains and more. But what about Classic Toy Trains? It refers not to the time it was made but mostly by design. Most of these classic trains are built and manufactured at the later years up to the current but are still called classic toy trains due to its concept, design and purpose. Classic toy trains are usually intended for kids, beginners and as educational toys. It is a starter set that comes at a cheap, reasonable and fair price. You’d seldom see a classic train toy of an expensive price. Relating to that, it does not usually come with a train table, a play-board or sometimes does not have train tracks. There are also some classic toy trains that do not have efficient compatibility over other train sets. It might be, however, irrelevant as classic toy trains are meant for newbies and kids. It also is considered to be a great educational toy for kids at a good price. The train set is not that great for hobbyist and enthusiast but it can highly benefit kids and young minds by helping them in learning and developing their skills. Who wouldn’t invest on a cheap toy that educates your children? The toys are remarkably, worth it. 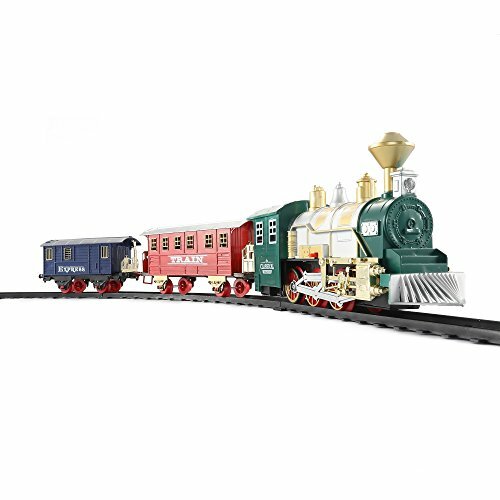 This is a classic train for kids from Env Toys that features a detailed steam train. 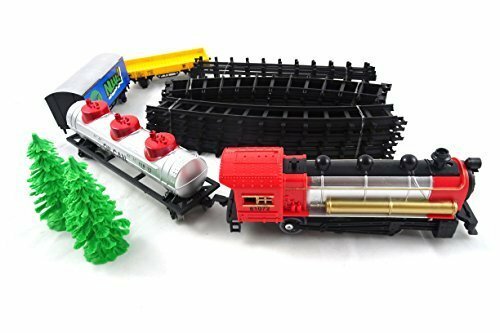 The set comes with its own plastic tracks where it fits and runs through perfectly. The train set is battery operated. Unlike other types of wooden train set, this train can actually run without a pushing effort from your kids and can entertain them for a long period of time. There are 2 pieces of trees included in the set for additional details. One of the most amazing, best-selling and highly regarded as educational toy is Melissa & Doug’s classic wooden train stacker. 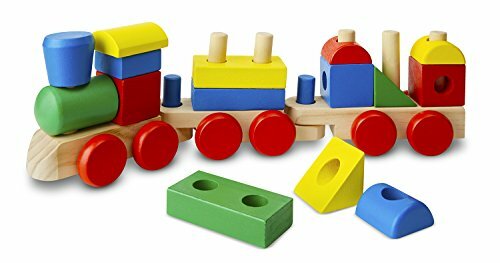 The train set is made of wood, carrying blocks of shapes that stacks together on top of the train set. It greatly enhances children’s set of skill and develops their mind, preparing them for good use in the future. Next is MOTA’s classic toy train. This is the usual choice for people who want a classic train set for their kids. The train set has remarkable details and features. It is complete with light, sounds, and puffs non-toxic smoke to make it more realistic. It comes with its own set of tracks that forms a wide oval shape. The toy is assured to fit in the standards of ASTM where it guarantees safety. The set requires 4 pieces of double-A batteries. Next is a longer version of the stacking train from Melissa & Doug. This classic wooden train set comes with 18 pieces, including blocks. The set is painted with different colors. This is to familiarize kids with color and shape recognition. The wooden train set promotes a healthy imaginative play as well as enhances hand-eye coordination skills and more. Melissa & Doug bring you another classic wooden train toy set. This is the Farm themed train set with 3 linking cars and a train engine car. 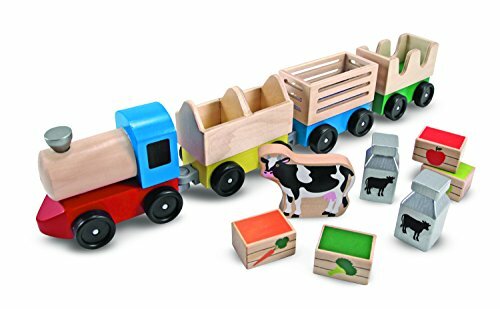 The set also includes cow animal figure and other things that a farm train carries such as fruit, vegetable and milk boxes. The wooden train set comes at a great and affordable price. It is painted with a variety of colors and comes at different shapes for enhancement of color and shape recognition. 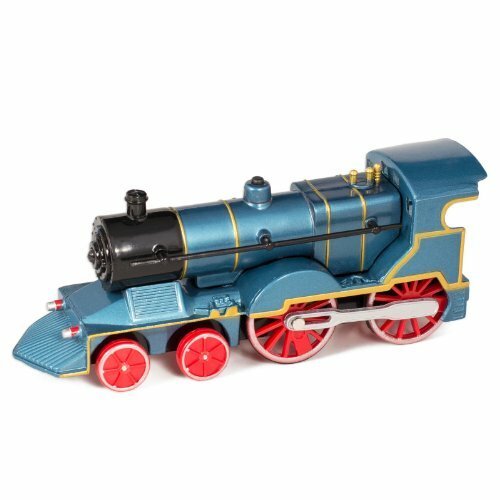 This blue metal casted train toy is from Master Toys and Novelties. It has shiny and glossy details. The set features sounds and lights that usually brings loads of joy and long hours of fun. This die cast metal train does not come with a train track but can perfectly run on smooth floors. The train toy measures to about 6 inches in length, 2.5 inches in height and 2 inches wide. Liberty Imports bring your their own classic electric train toy. This delux set comes with 3 train cars and a 12 feet train tracks. The tracks feature a wide 8 figure layout with pillars that creates a strong and stable elevation. The set includes a total of 71 pieces of wonderful pieces. It uses a battery operated train with bright headlights and can produce realistic train sounds. This is Vokodo’s Army Style Classic Train Toy. It uses military camouflage design that features a train set carrying military supplies and equipment. The train set produces non-toxic and safe smoke to make it more realistic. It has a bright headlight and realistic sound features. The train carries a large tank and a military helicopter. It comes with a fairly wide oval plastic train tracks. A more fun way to enjoy a train set is with the advanced motorized classic Thomas railway set from Advanced Play. The train set features a train track layout with a large dinosaur on one end where the train passes through. The dinosaur figure acts as a tunnel for the Thomas train toy. It comes with a plastic, figure 8 tracks with a bridge that connects in the middle. The next classic Thomas Train set is still from Advanced Play. It still features the same concept where a large T-Rex can be found and the train uses it as a tunnel to pass through. The difference however, comes with the layout of the train tracks. This one uses a simple track, flat on the ground, with no elevations. It is also slightly cheaper. The train is also motorized or battery operated. This is Kinder Toys Network, battery operated classic train toy set. There is a total of 13 pieces included in the set. 4 of them feature a detailed train car and a train locomotive that measures to about 5 inches in length. The rest of the pieces are the tracks that form a simple oval shape where the train set can run through stably. The train locomotive does not have an operating light but puffs realistic smoke and produces realistic sounds. Here comes the classic battery operated train set from Nicky Big Novelties. The train set for kids features a fairly long locomotive and train cars. The set is complete with light, sound and movement features. It requires 2 pieces of double-A batteries to run/operate. 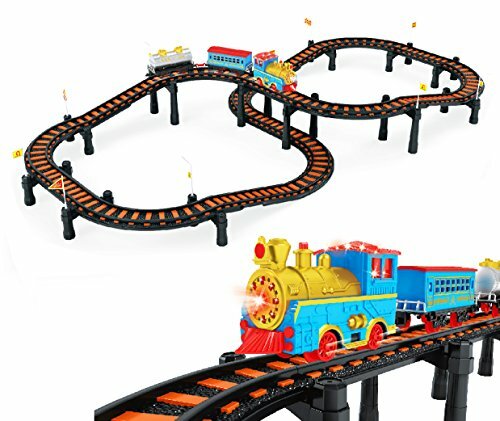 The set includes 10 pieces of strong and durable tracks that forms a large oval. It has an easy switch on and off button.